Peanut butter is unquestionably the go-to nut butter in the kitchen. It has a lot of flavor and it’s readily available, usually at a much better price than other nut butters. But as with all things food-related, it’s nice to have some other options and deviate from the standard from time to time. In this case, that means experimenting with some non-peanut butter nut butter (boy, is that phrase a mouthful! ), whether just to get some new flavors into the mix, because you find that you need to avoid peanuts because of allergies, or some other issue. I’ve used cashew butter before with good results in cookies. For today’s batch of cookies, I opted for sunflower seed butter. This is a good choice for people with peanut allergies, since it is actually completely nut free. 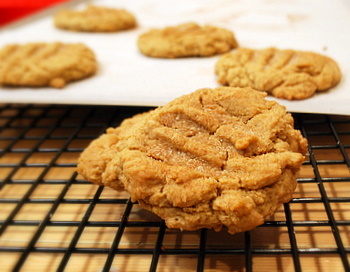 The cookies are much like peanut butter cookies, with a chewy and crumbly texture – I even used a fork to score the top, so they look quite similar, too. They don’t quite taste like peanut butter cookies, however. The best way to describe the flavor of sunflower butter is to say that it is somewhere between the flavor of peanuts and sesame seeds, but fairly mild. It’s unique, but unless you have a strong aversion to regular sunflower seeds, most people will find it to be quite appealing. The cookies have a subtle nuttiness and a hint of sunflower seed flavor, and the end result is that they taste like very subtle peanut butter cookies. If you don’t tell people that they’re not peanut butter cookies, they might not be able to guess. To give the cookies a little more dimension, I topped them with a cinnamon sugar mixture that, in addition to beingÂ a bit generous on the cinnamon, had a big pinch of salt added to it to bring out the nutty flavor of the butter. In a large bowl, cream together butter and sugars. Beat in egg, blend in vanilla and sunflower seed butter. Add in dry ingredients and mix on low speed until combined..
Drop dough into 1-inch balls on prepared baking sheet. Dip a fork in water and press down gently to flatten each cookie. Sprinkle with cinnamon-sugar-salt mixture. Bake for 10-12 minutes, until just beginning to brown on the edges. Cool on baking sheet for 5-10 minutes, then transfer to a wire rack to cool completely. I just ate a little sample of a tiny little cookie at the store today that has sunflower seeds in it and it was really good. Love the idea of using sunflower seed butter. I haven’t even tasted that in ages. Will have to look for it. I just received a jar of sunflower butter, it is some potent stuff! It has a stronger sunflower flavor than any peanut butter has peanut flavor, if that makes any sense. It’s always amazed me how other nut butters are fairly interchangeable with peanut butter in baking/cooking, it’s so odd considering a peanut isn’t even a nut! I should make a small batch of these with the sunflower butter I have. I was really curious how sunflower butter would perform in terms of flavor, but was more worried about it tasting too strong, so it is good to know that it is milder. How interesting! I’d love to try these. Great experimentation!! By the way, congrats on making the London Time’s Top 50 Food Blogs. Your blog definitely belongs at the top; I just love it! Congrats on being named one of the top 50 food blogs by the London Times! You absolutely deserve it–you always have great recipes and tips. I would love to try this with sunflower butter, but you mentioned cashew butter and that really sounds good too! Sunflower butter? Wow, I have never heard of that before. I’m starting to realize all the different varieties of food products that are out there. I was watching Good Eats on the Food Network last night and he was going over all the different types of vinegar there are…some of which can be easy substitutes in your cakes. And what a great alternative for those who are allergic to nuts! I’m so excited you’re posting a recipe with sunflower seed butter! I’m allergic to nuts, so sunflower seed butter is a great option for me. I can’t wait to try this! Gia – Definitely! You should be able to use any kind of nut/seed butter for this recipe. Nice! Never thought of using it in baking. oooh I LOVE Sunflower Butter! Yummy! this will be great for me as I’m allergic to peanut butter. Wow these are great! My daughter who is 2years old loves them not to mention my fiance who was an avid peanut butter eater. I made a batch and they dissapeared in 3 days…. The best way to describe the flavor of sunflower butter is to say that it is somewhere between the flavor of peanuts and sesame seeds, but fairly mild. Itâ€™s unique, but unless you have a strong aversion to regular sunflower seeds, most people will find it to be quite appealing. These were fantastic! By far the best recipe I’ve found for sunflower seed butter cookies, and not as crumbly as the recipe I tried to make myself. I just wish I’d added less sugar, as they were overly sweet. Next time, I’ll probably go with 1/2 or 2/3 a cup, rather than 1 cup. Do sunflower seed butter cookies need to be refrigerated even after baking? I just noticed that the cookies I baked 2 days ago are becoming green on the inside. This doesn’t look like mold, it almost looks a plant is trying to bud. Do you have any idea what is causing this? My family loved them! They are delicious! Apparently it’s a completely harmless reaction that occurs when the sunflower seeds naturally occurring chlorogenic acid comes in contact with baking soda. The website says it can be counteracted by adding lemon juice to counteract the alkalinity… anyway, I’m off to try this recipe! I just finished making a batch of these and am in love! I adore peanut butter cookies…but I think I prefer these cookies over the pb kind. They are more subtle and yet still nutty-ish. Yum – thanks for this recipe!